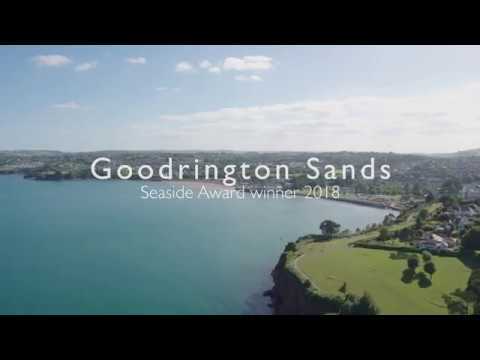 Located close to Paignton on the South Devon coast, Goodrington has everything your family needs for a traditional seaside holiday. Goodrington beach is divided into two parts, the North Beach and the South Beach. If you’re bringing the dog, you can walk him any time on the North Beach. However, between the months of May and September, dogs are banned from the South Beach. In either case, there is a strict anti dog-fouling regime on both Goodrington beach and the adjacent park, so make sure you pack your doggie bags and pooper-scooper. Goodrington Beach has won a prestigious Blue Flag Award for cleanliness, so it’s safe for kids of all ages. The beach is kept clean and hazard-free by daily raking with a tractor that gets rid of stones, pebbles and seaweed. Safety is also a priority, with a designated safe bathing area and lifeguards in attendance during the summer months. The waters in this area are shallow, so toddlers and young kids can get wet without parents worrying. At low tide, you can find loads of rock pools for little ones to explore because there’s nothing that fascinates a kid more than discovering sea critters that have lots of legs. If you want to take it easy then you can hire pedaloes, sun loungers, beach huts and deck chairs. But for a shot of excitement there are various water sports on offer, including water skiing and ‘ringo rides’. Younger visitors will be able to make the most of the QuayWest Water Park, which boasts eight water-slides and flumes, the Kamikaze ride and a supervised play area for toddlers. Goodrington Park is within walking distance of the beach, where you can spend some time mucking about on the boating lake, race in go-karts, play crazy golf or get clued up on the local environment with a visit to The Seashore Centre. If you want to explore the region a little further, then hop aboard the steam train that follows the coastline from Paignton to Dartmouth. From Paignton, take the coast road heading towards Brixham and Goodrington is signed. There is a regular bus service. Paignton is the nearest town with good main road access. There is ample parking as well as local rail and bus services. Bus number 12 runs very frequently.